Home » Blog » 8 Things Even Normal People Hoard: How Many Are Hiding In Your Home? 8 Things Even Normal People Hoard: How Many Are Hiding In Your Home? As much as we might enjoy gawking at shows like “Hoarders,” marveling at the messes lurking behind homeowners’ front doors, let’s be frank: We all hoard something, at least a little bit. You may call it clutter, but it’s a slippery slope from clutter to mounds of junk, right? So here’s how to identify your inner hoarder, target your secret stash (or three)—and finally let go. People often stockpile magazines for years and years, thinking they’ll eventually read that article on Belize or try a certain squash recipe. To let go: “A general rule of thumb is to get rid of a magazine when the next one arrives,” says Kero. Remember, most information in those magazines can also be found online now. And if you get months behind on your reading, perhaps it’s time to cancel your subscription. Early drawings and even loose sheets of paper that your child scribbled on can quickly stack up, filling box after box. These same boxes then usually get moved from place to place without anyone ever looking through them. If you’re on the fence about tossing something, scan it or snap a digital pic to preserve it forever; numerous phone apps such as Keepy make this process easy-peasy and regret-free. Some of Kero’s clients have so many decorations, “it looks like the holiday threw up all over their home.” Other people are sentimentally attached to their older decorations and keep them even though half of the lights burned out years ago and Santa looks more like a scary clown than a jolly old elf. To let go: Keep what looks good, and pitch items that are torn, missing parts, or just plain broken. “It’s OK to make new holiday memories by finding just the right replacement,” says Kero. Plus, newer decorations pose less of a fire hazard. From black-and-white snaps to Kodachrome prints, the average household has thousands of photos from before the digital era. Most of us are guilty of hanging onto boxes of battered snapshots because it’s a huge pain to organize them. To let go: To avoid getting overwhelmed, approach this task in segments: Do an hour of photo sorting a week until the job is done. 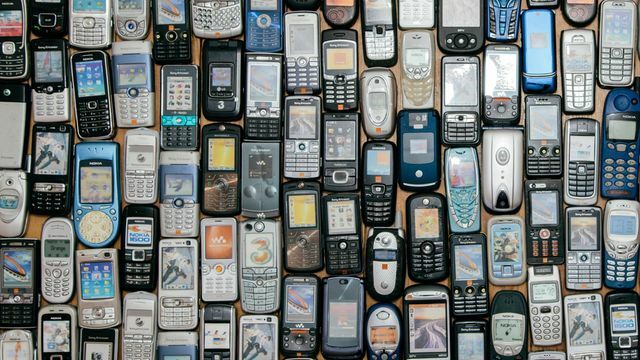 CNET estimates there could be up to 1 billion unused smartphones alone in the U.S. That means we each have four to eight out-of-date tech gadgets languishing in our junk drawers. To let go: Old tech has value. Per household, your unused smartphones could collectively fetch anywhere from $500 to $1,000. You can sell your old gadgets to trade-in companies like Flipsy. Or donate your various electronics and take advantage of tax deductions. Do you have a bread maker you’ve never plugged in? Or, god forbid, a pickle fork? Anything that sits and collects dust in a cluttered mess on countertops or in various kitchen cabinets is just pointless, period. To let go: Keep only what you regularly use and have space for. “Gadgets are great, but if you aren’t using them they’re kind of useless,” says Kero. Kero has clients with clothing they’ve owned for more than 20 years that they know they will never wear again, but keep anyway. For one woman that included a pair of ribbed, acid-washed jeans from 1980. To let go: “If you haven’t worn it in over two years, or clothes don’t fit or hurt to wear, let it go,” says Kero. An heirloom can be anything that someone who has died once owned. Some we may treasure, but others we may be dying to get rid of, if only we didn’t feel so guilty about tossing it in the trash. To let go: Just because one person loved something doesn’t mean you have to as well. “Unless you really treasure an heirloom, sell it or get rid of it because it’s not doing you any good—emotionally or spiritually—to have it taking up your physical space,” says Kero. Or hey, fob it off on another family member!